Before setting out for any endeavor or continuing with an existing one, it is prudent to seek some glimpses of assurance of success otherwise one may be heading for doom. This article is my little contribution to the emancipation of humanity especially those in the sinking Nigeria. It will be advisory. I am doing this in line with the local adage which says that it is not proper for a goat to bear its young with a flex on its neck. I am not an elder though, but you must permit me to assume one at least for the time being. After all the elders at “Ohanaeze ndi whatever” has made nonsense, the saying that what an elder sees sitting down, a youth cannot see even while on top of a mountain Everest. Perhaps it is the ripe time for the stones to be raised as the lord would put it to praise him since the “Pharisees and Sadducees”, have sworn to prevent these little ones from praising him. We the youth must take up the role of proper guidance and counseling both to the Nigerian authorities and every other party or individual concerned including IPOB. In it I shall be highlighting some bare sure signs that too many a people seem not to be aware of. Conceivably, the ignorance is deliberate. I shall be proving to you that with the signs I see, Biafra is as good as achieved and there is nothing stopping it. At the end as long as you are open to logical reasoning, you will for sure take a decision either to continue on the path you are toeing now or retrace your footsteps. So patiently come with me having some wisdom as your companion as we look at a few of the signs. God is pro-Biafra: If you have been following the activities of the group championing the restoration struggle, you will agree that they have put God first. They have not depended on their might, for sure, they are aware of the biblical injunction “trust in the lord with all your heart and lean not on your own understanding. In all your ways acknowledge him and he shall direct your path”. The turn out of events and the wisdom at the disposal of the leadership of IPOB says it all. Have you ever considered how an organization as large as IPOB is being controlled and kept off violence even in the face of extreme provocation with nothing other than mere words? Do you think earthly wisdom can achieve such feat? Little wonder their leader never makes any broadcast without giving quality time to prayer of thanksgiving and supplication. Gamaliel said to his fellow scholars and I quote though not verbatim I beg your pardon; “if this man be from God, no one can stop him”. The people's will is so strong: A popular and one of the most truthful maxims of all time says “where there is a will there is a way”. The level of never say die attitude in Biafrans as it regards the restoration of their beloved nation is second to none. 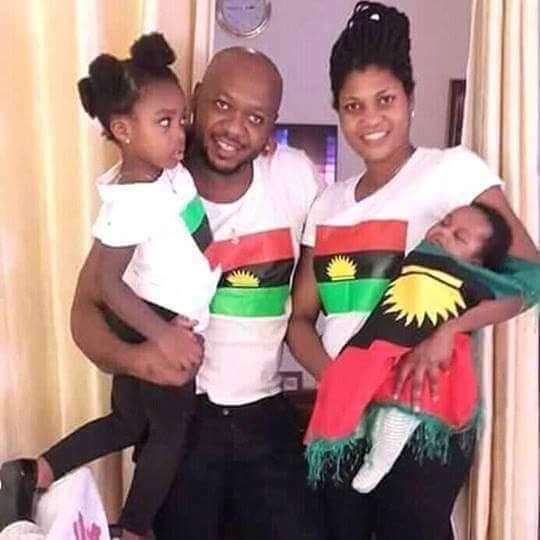 The resolve is so strong that you hear expressions as; No retreat no surrender, it is Biafra or nothing, it is either we get Biafra or we die getting Biafra to mention only a few. These words are not just being said but we see them lived-by daily. The power of the barrel has failed. Military clampdown, suppression, torture, intimidation, imprisonment and what have you have all been made docile. Of course when a man lays down his life for a thing, it is only foolish to think you can stop him by force. The only tool to apply on such a man is working to see what made him reach such a resolve and finding a way to have him change it from within. But who will teach Nigeria wisdom? Oh! Foolish Galatians who has bewitched you? The death of the president: This sign has a whole lot of bearing with the first one. It was reported some time in 2016, that the then Nigeria president or better put head of state had said that it will be over his dead body that Biafra will be restored and the all-wise God decided to honor his own very words. Today where is he? Your guess is as good as mine. In the wake of all these signs, “what men ought ye to be?” “Shall we continue in foolishness that blood shed may abound?” God forbid. Wait a minute, are Nigerians not seeing the hand writing on the wall? I fear for you all. If you cannot prevail on your government to do the right thing then you are among men most miserable. Perhaps you may want to keep a date with me on my next work with the title “the pharaoh in every Nigerian”. How about the Nigerian authority? The “ogas” at the top. Isn’t time you consider changing your style? Why not try something more modern? Why not listen to a simple and easy request by IPOB, conduct referendum for us they say. What is the big deal in this? One would expect the government to be the first to place referendum on the table but the case is the opposite. Not funny! To Britain, Nigeria as history told us was fathered by you. The mother we do not know, imaginably, even history can’t tell. Who knows, Nigeria is a motherless child. Just kidding on that one. Why not perform the role of a responsible father? The house you built for whatever reason is under the control of a mighty conflagration and you do nothing? I smell hate-the lack of fatherly love. You have granted referendum to Scotland, you had one to decide your membership of the EU, why not guide your “oldest young son”, aright? To the UN and other powers that be, Nigeria as a member state is violating the rights of indigenous people. It is your duty to protect them please do the needful. I heard you have an act covering such, please do enact it. Lastly, to IPOB, you have come thus far not by power nor by might but by the spirit of Elohim. For “by strength shall no man prevail”, “Thou shall have no other god before me”. “The arm of flesh will fail thee, ye dare not trust your own”. That said, it is pertinent as well to tell you “hoha”, that there is but one person, group or people that can stop the restoration of Biafra and guess who, not Nigeria, not Britain but you yourselves and you. When the will dies, the way ends. Keep the fire burning. You are almost there.